Not long ago, Fuzz surprised me by requesting a pint of Ben & Jerry’s Cheesecake Brownie Ice Cream. While I fully support her adventurous flavor choices, I was surprised she’d chosen one flavored with cream cheese brownies. When I asked her “Why cheesecake brownie ice cream?” she told me it was her favorite type brownie. Again, I was surprised. I hadn’t made those in ages, yet she remembered the flavor and that she liked them best. I decided right then that I’d make her some cheesecake brownies. But I didn’t. I waited weeks and weeks. I’m not sure why I waited so long but today seemed like the perfect day for Fuzz’s cream cheese brownies, so I looked at dozens of recipes and ended up making these. This is quite a popular recipe. You can find it in many places including allrecipes.com and Recipezaar. And a years ago Smitten Kitchen made a Cooks illustrated version where the filling was the same. And it’s the filling that I don’t like. It’s kind of eggy, thick, and the butter buffers the tanginess of the cream cheese. So maybe this recipe is popular with people who don’t love the flavor of cream cheese? I don’t know. It’s not my favorite, but the brownies aren’t bad and hopefully Fuzz will approve. I kind of wish I’d made The Red Hat Society recipe. I’m going to chill these for 24 hours and share them with the neighbors tomorrow night to get some opinions. Maybe I’m being too hard on the recipe. Cream Cheese Brownies made with German's brand chocolate. Preheat oven to 350 degrees F. Line an 8 inch square metal pan with foil and spray foil with cooking spray (or use nonstick foil). Make the cream cheese filling first. In a mixing bowl, beat the butter and cream cheese until smooth. Beat in the sugar, then beat in the egg. Stir in the flour and vanilla. Set aside. Make the brownie batter. In a medium saucepan, melt the butter over medium heat. Reduce heat to low and add the chocolate, stirring over low heat until chocolate is melted. Set aside to cool. With an electric mixer, beat the eggs for one minute. Gradually add the sugar and beat until thick and pale. Beat in vanilla, baking powder and salt. By hand, stir in the flour. Stir in melted chocolate mixture. Pour about 3/4 of the batter into the pan. Pour the cream cheese mixture over the chocolate batter. Pour remaining chocolate batter over cream cheese mixture, leaving gaps so the cream cheese shows. Bake on center rack of oven for 35 to 40 minutes. Let cool to room temperature, then chill brownies until firm. Remove from pan by lifting foil. Place on a cutting board and cut into 16 squares. I’m sad to say my brownies didn’t work out and I threw them away. I think I’m going to try the recipe from David Lebovitz next. I guess his recipe is the one you are making right now. I just came back to say I have the “Ready for Dessert” Cheesecake brownies in the oven and now I see the nice comments about them from others above. Unfortunately they call for a 9×9 inch pan and I only have 8×8. I can’t wait to hear about the brownies you mentioned in your giveaway post! I have to second another commenter and recommend David Lebovitz’s version from his latest book. I made his with a nice bittersweet chocolate that gave the brownies a nice strong chocolate flavor and the cheesecake portion had a great flavor that was not overly butter based. The best, best, best cheesecake brownies I’ve ever had (and made) are David Lebovitz’s. They are to die for and always get tons of compliments. I’ve made them with dark chocolate toblerone to change it up a bit and they were super yummy. i never knew they had that ice cream flavor! Anna, glad to hear that Fuzz is developing her taste buds. 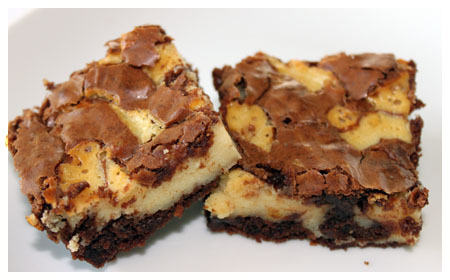 Cheesecake brownies are a favorite of mine but I do like to taste the cheesecake filling. Yum…brownies and cheesecake are a classic combo. These look great! 1 lb.!! That’s a lot of cream cheese. I’ve made several different cream cheese brownie variations (peanut butter, mocha, etc. ), crafted together from varoius sources, but I’ve actually never seen a recipe that called for butter in the filling! dave lebovitz has a to die for version that i love. but these are just as good miss anna! Camille, thanks! I’m glad you liked the picture. Sue and Chris, I’m astounded that you two haven’t tried cream cheese brownies. Put them on your list!!! ;). Judy, thanks for the link to your blog. Jaclyn, I like lighter versions of recipes on occasion and might give this one a try. Karen, thanks for the link. Also, the Ben & Jerry’s ice cream is pretty good. It’s a cheesecake based ice cream with chunks of brownie in it. The cheesecake flavored ice cream is very tart. ps How was the ice cream?? I’ve tried dozens of variations for brownies, and cream cheese brownies are one of the best. Yummmm! Oooooo! These look delicious, and honestly, I’ve never even heard of cream cheese brownies. I’ll definitely have to give them a shot. I’ve never made a cream cheese brownie! Can you believe that!? No doubt I would love them. What’s not to love? Cream cheese – love it. Brownies – Love them. You’ll have to let us know how Fuzz likes these. She must be developing quite the palate, and taste memory.